Last Tuesday, the man sitting across from me in a coffee shop struck up a line of questioning. 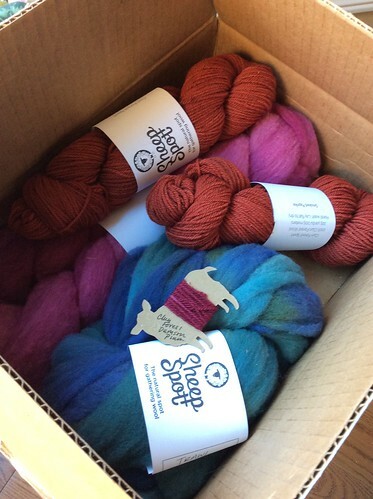 I was a little in love with swatching my Clun Forest wool yarn from Sheepspot it being for baby nephew and all. You knit because it is relaxing, yes? “No,” I answered laughing. “I knit because I get to have the things that I make,” pointing meanwhile to the little swatch-in-progress. He & the 2 friends were stumped. He gave a, “Huh,” and asked again. “Right. It is relaxing. I like the process but I knit to make things.” The conversation marched on. That Tuesday’s sweater is a good example of what, “I get to have this” means. A 100% Finn wool sweater that left the industrial complex at an early stage as combed fibre. It ticks these boxes: soft, comfortable, fits, layering, warm, and brighter than anything an Ontario winter can throw at it. Even if I could get this breed-specific wool as a durable, fitted sweater off the shelf (and I can’t), the single greatest attribute of my version is the expression of ideas. It is what I chose for lunching with my spinning mentor/friends that day. They last saw it on the needles. It said, “Yeah, people spin yarn,” in a coffee shop, and that a red dye is from scale insects. Right here on TKK it was all about the neck steeking, and the stress knitting in its day. Later on, I had to shorten the long sleeves. It is documented on Ravelry; could still be even more. In special cases like the expected baby nephew, I knit, and even spin for deserving others. Sometimes knitting is relaxing. Sometimes it really isn’t relaxing at all. Sticking to it gets you more than entertained, and that’s the point as I see it. Here’s to hoping that all our FOs will be all that and then some in their own time! 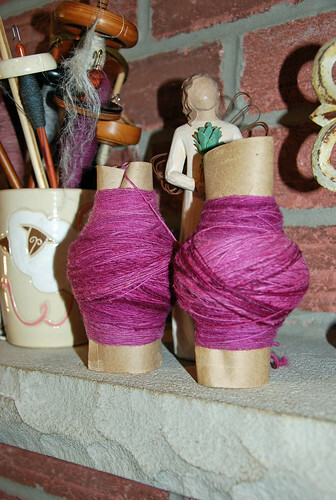 In the last post, I shared a new purple wool spin on the Canadian Production Wheel’s bobbin. It was the Columbia wool roving at the bottom of the box there. 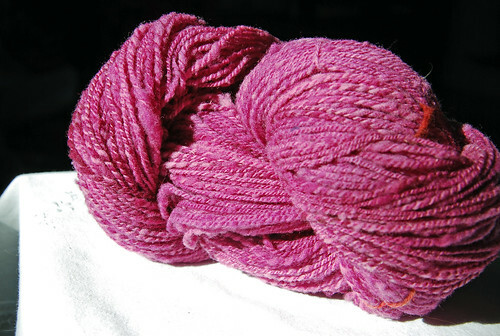 This roving was 119 g of Sasha’s ‘Orchid 1’ colourway. I really enjoyed the darker spots. 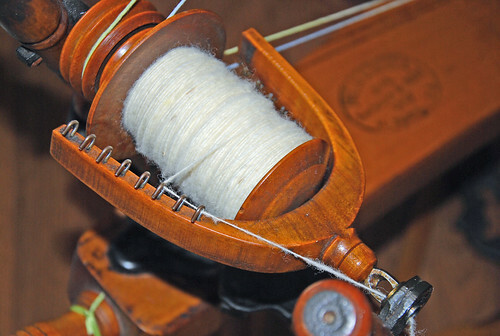 The 1st bobbin was spun before our trip last year, and the 2nd bobbin followed on January 18th. The 310 yards were plied on the same wheel after I reversed the twist in the drive band. This Philias Cadorette CPW really does better spinning left if I reverse the band. I also changed to the second ratio. One good long-draw experience leads to another! I have spun all 150 g of this Columbia roving from the Fibre Garden up now. We are still climbing over the big girl because the 124 g batch has come out to play as well. I may need to get more soon! Categories: Spinning, Stash in; Stash out, Uncategorized | Tags: Canadian Production Wheel, Clun Forest wool, Columbia wool, socializing, Spinning | Permalink. Do you still have the CAP? I just came into possession of one in need of TLC. I need good photos of the mother of all. I believe mine is missing parts. Thank you for your help. Hi, Donna, Yes, I still have this wheel! The first post when the CPW came home has some detail pictures of the mother-of-all as well as the whole wheel. You can find the post here: https://theknitknack.wordpress.com/2010/07/10/act-of-kindness/ If you search “CPW” in the blog’s search bar you can also find other posts where I have shared images of the same wheel. Best of luck getting your wheel functional! I always recommend the “CPW Lovers” group on Ravelry for new owners of these wheels. It’s an excellent resource, and how I started learning about mine.